In this post I’ll share a working example that uses Jenkins to build and test your Docker Compose cluster. For this example I created a simple Rails project that connects to Postgresql and Elasticsearch. 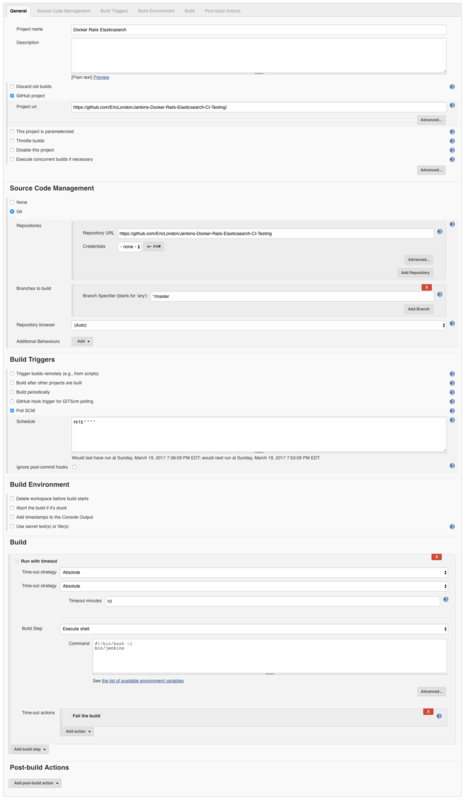 I used RSpec to test the connectivity of the container services, and then configured Jenkins to build the project and run the test suite. I installed my Docker dependencies via Brew on OSX. Execute bundle install to install the new gems. Executed rails g rspec:install to generate the default RSpec configuration. echo "Postgresql is not ready, sleeping." echo "Elasticsearch is not ready, sleeping."